Just look who they are putting on the Sunday talk shows. What does that have to do with Bias. I wonder why some of these guys actually show up on those shows. It isn't who is there, but how they are questionned. Heck, Hannity has liberals on his show. I don't understand why they go on there either. I am glad you posted this though. I had a queston I forgot to ask this morning. I watched the tea partiers get hammered for some of their participants who were uncivil, both in speech and their signs. I saw Palin get hammered for the target thing. We need to be more civil was what the media was pounding into us. Let's say Fox news wasn't beating those folks up, just CNN, CNBC, ABC, CBS, NBC, et. al. Now I see some of the elements in the Union marches doing the same stuff. I saw a target (cross hairs) on Walker. Called Hitler. Potty mouth speech. I see Fox calling attention to the stuff, but not CNN, CNBC, ABC, CBS, NBC, et. al. Would you and those others who lean to the progressive side agree with me that all those folks see everything from one side. This is real easy for me to explain. The Union folks are simply passionate about their just cause. Baggers on the other hand are ignorant and emotional. Serously though the next yahoo on any side of any issue who brings a picture of Hitler to a rally should be pelted with garbage. It does. I don't know why I can't figure this stuff out on my own. Seems so simple when it is explained to me. 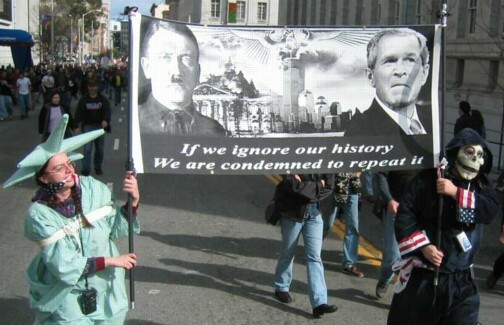 To compare someone to Hitler, I think they need to at least be accused of actual genocide. Hitler is so radioactive that even talking about his politics should be verbotten. Are you some kind of Nazi? Kudos to David Carr of the New York Times for shining a light on an issue that doesn't attract nearly the attention that it should: the Obama administration's abuse of the Espionage Act, which in turn has led to a virtual war on journalism and free expression. As Carr notes, the Espionage Act, approved in 1917 during the hysteria of World War I, was used three times before President Obama took office in 2009 -- and six times during his presidency. If by “change” President Obama meant criminalizing journalism in the United States, then he’s succeeded. Why should you care? The investigative journalism that Obama has silenced could have exposed more corruption in the U.S. government, military, banking industry; corruption that has caused anguish to numerous Americans. The reports that will never be heard, read, or seen on TV may have led to positive change. The Obama administration is suffocating investigative journalism at an alarming rate through the abuse of the Espionage Act of 1917, an act more prone to be used to protect government secrecy than national security. Before Obama, the act had been used only three times total since 1917. The current administration has used it six times to go after whistleblowers and the journalists who protect and reveal their information. Risen predicted Obama’s attack against him would have an unprecedented chilling effect on mainstream investigative journalism in the US. He was right. Last edited by Uncle Ted; 11-03-2012 at 09:00 PM. Dear Leader does not approve of anyone who makes known what Dear Leader doesn't want known. You won't get much disagreement from the left on this issue. The number of prosecutions under the Espionage Act has been ridiculous. That's why most of the criticisms you see are from the left: Salon, NY Times, Huffington Post, Daily Kos, etc. Well, this settles it. A single Sunday Morning's slate of guests looks pretty conservative. So much for the tired notion that there's any liberal bias in the MSM. Y'all are willing to just sweep all of that under the rug based on the simple fact that Obama is a Liberal and vote for him anyway? What happened to all the good ole' Liberals I use to know?... Somehow does the fact that Obama is one of your own make it all better? 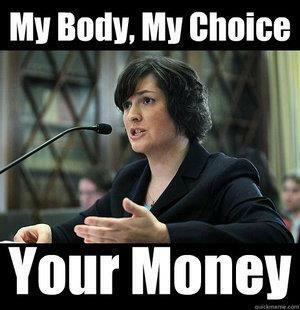 Ironically, the Liberals get all bent out of shape when someone mentions the idea of legalizing prostitution which would give women even more choices on what to do with their bodies. You liberals are funny people. Of course, so are the overly religious republicans and tea partiers. I think these guys try to do a good job of studying media coverage for quality, ideological leans and biases. I try to read a wide variety from different sides of the spectrum, and I think these charts they produce are pretty much right on. I also like the charts that plot the individual shows on each of the major networks. Last edited by BlueK; 02-01-2019 at 06:59 AM. Thanks, I find those very interesting. Agreed. I'd like to see them add the FoxBusiness shows on there. Good old Lou Dobbs would find a nice home down there in nonsense corner with Hannity. Example: his comment that Mitt Romney's mild rebuke of Trump constituted "treason." That’s going to piss some off that mainstream outlets are most neutral. One thing I really tire of when it comes to complaints about liberal bias is people equating WaPo, NPR of the NY Times to Breitbart or Rush Limbaugh. Lou Dobbs being case in point. No honest person in the media who took HS history would equate Mitt Romney's comments about Trump from a few weeks ago with "treason." BS like that isn't just something that leans a little to the right like "The Washington Times." It's willfully distorting and dishonest in the hope of persuading a few nitwits who have never read the Constitution to give their full loyalty to Trump the way it's done in non-free authoritarian countries. Last edited by BlueK; 02-01-2019 at 09:00 AM. Trump isn’t following his doctor’s advice to lose weight and eat better!! Pretty sure about 98% of all people don’t lose weight or eat better after the doctor tells them to do that. Not to go all Uncle Ted but wasn’t Obama still secretly smoking as president? I missed the articles slamming him for that. Trump isn’t 98 percent of people so it’s newsworthy. His health is news. As for Obama smoking. How would you know that if the media didn’t report it? Last edited by frank ryan; 02-08-2019 at 05:14 AM. Former House Speaker John Boehner says former President Barack Obama is "scared to death" of his wife, Michelle. She knows where his Super Suit is located, and when he goes off on some daring-do. BBC cameraman gets blindsided and shoved to the ground while covering Trump's rally.